Welcome! Please bear with me as I work to make this site more compatible with mobile devices. This site is best viewed at 100% . I am Pat Sabin, County Coordinator for the Dorchester County SCGenWeb Project. I also host the Colleton and Bamberg County SCGenWeb sites. My "lowcountry" families include Ayer, Byrd, Gavin, Hughes, Raysor, Risher, Stokes, and related families. My contribution to the Dorchester County SCGenWeb site is in maintaining the project site. If you have any documents, such as wills, deeds, Bible records, old letters, groups photos, church histories, etc., please consider submitting them to the Dorchester County SCGenWeb Project to share with other "seekers." PLEASE NOTE: I do not live in South Carolina, and regret to say that I am unable to help with personal genealogy research unless it coincides with my own family research. I upload information as it is received from volunteers, and everything I have is on this site. Please let me know if you would like to register your surnames. I recommend that you post queries on the RootsWeb/Ancestry and the GenForum (Genealogy.Com) forums linked below. The USGenWeb Project began in 1996 as a group of volunteers working together to provide Internet websites for genealogical research in every county and every state of the United States. The Project is non-commercial and fully committed to free access for everyone. Organization is by county and state, and this website provides you with links to all the state websites which, in turn, provide gateways to the counties. The USGenWeb Project also sponsors important Special Projects at the national level and this website provides an entry point to all of those pages, as well. The SCGenWeb Project is a member of the USGenWeb Project. Read about the History of the USGenWeb Project. Dorchester County was named for Dorchester, Massachusetts. In 1696 Congregationalists migrated from Dorchester, Massachusetts to South Carolina, establishing a new settlement called Dorchester. 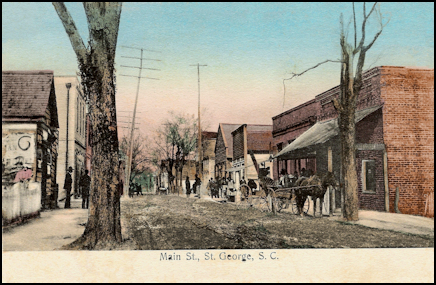 The original town had been abandoned by 1788, but the parish continued to refer to it as St. George Dorchester. The area of modern Dorchester County was, in 1710, part of the old Colleton and Berkeley Districts. In 1769 it became part of the Orangeburgh and Charleston Districts. In 1801 it was incorporated into the new Colleton County. Dorchester County was formed in 1897. How You Can Contribute to the Dorchester County SCGenWeb! "Memorial Stones": To date over 270 books have been sold. The book contains over 15,000 cemetery inscriptions in all cemeteries in Upper Dorchester County, as well as 13 from Colleton County, and two from Orangeburg County. "A View Of The Past" Recently our society received 200 reprinted copies of "A View of the Past." This book is a collection of homes and sites in Upper Dorchester County prior to the 1940s. This is our 3rd printing. If you would like to have a copy of these books for your collection or for a gifrt, you can pick them up locally at the Dorchester County Archives & History Center, 101 Ridge Street, St. George, ordered from the UDCHS Web Site (www.upperdorchestercountyhistorical society.com) or by mail: UDCHS, Post Office Box 15, Dorchester, SC 29437. The books cost $45. Add $7.00 for shipping and handling. Dorchester County Archives and History Center is now offering printed & spiral bound Family Trees. Up to 20 pages, $25.00. Up to 40 pages, $35.00 . $1.00 per page for each page over 40. To find if we have your family in our records, please contact crice@dorchestercounty.net . Note, these are old entries that predate the GenForum and RootsWeb forums. Information is bound to be obsolete, but I do not want to remove any valuable data which may help in your research. a HUGE contribution to Dorchester County online Genealogy!